This reminds me of my dear belated Mother. She just ♥ pea soup. Spices (this is totally up to you what you like to use in your soup). 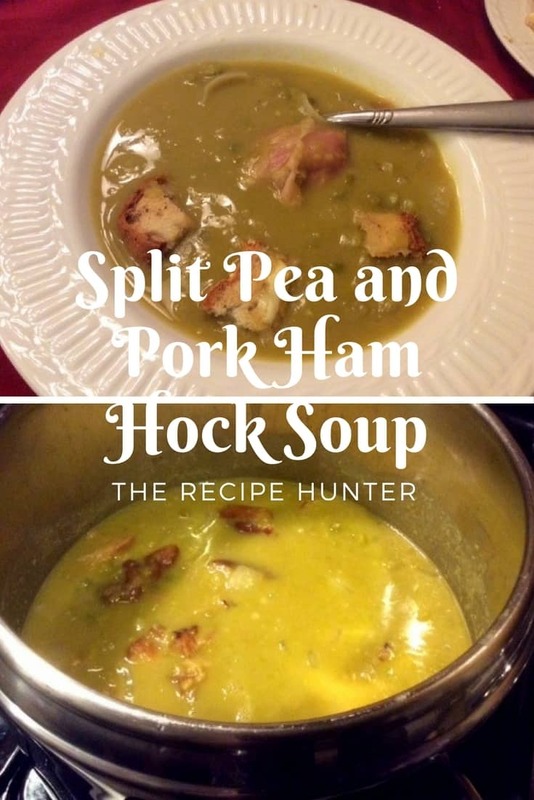 We tend not to overdo it with spices, as we just ♥ the plain pea and ham flavor for this soup. Add the boiling water to the peas and let it soak for ± 1 hour. Braise the onion in a little oil and set aside. Cook the pork ham hock in a large pot with some water and spices till 3/4 way done. Add ½ to 3/4 of the peas to the mix, plus extra water, and cook till peas totally mushy and meat falling off the bone. You can now cut the meat it into bite-size pieces but leave the bone up until the end for extra flavor. Add the rest of the peas and onions (as well the water *** you had left over from soaking the peas) to the pot. Cook till soft, but NOT mushy. We prefer to have some texture, but if you prefer a smooth soup, feel free to puree all except the meat. Serve hot with croutons (I use toasted GF bread cut into small cubes) and if you like add a drizzle of cream. This is in my books = moreish. As this is a huge pot of soup, we usually leave the rest overnight, or till cold, and dish into small containers and freeze for later use. When you take it out, defrost at room temperature and add some boiling water to the mix and heat in the microwave and you have a wonderful ready in no time meal. Thanks so much for visiting, I still have some left in the freezer and its a cold and rainy day here so I think I will just thaw the rest and voila all done for our evening meal. Oh, what childhood memories I have this soup. Thank you for the reminder, Esme! I don’t think I ever appreciated the comfort of this soup as a child, but have grown to love it so. Thanks for stopping by and your comment. Yes, this reminds me of my dear mother, and we make this in her honor and also talk about her love for it when we enjoy it.